So I tried to look up who had more folks in the Basketball Hall of Fame - Carolina or Duke. Then I saw this headline from SI.com, and thought, eh, who cares. Hehehehe. In the words of one of my guys at work, good win. Of course, it's that same guy who faithfully reports the Carolina scores to me after every game. 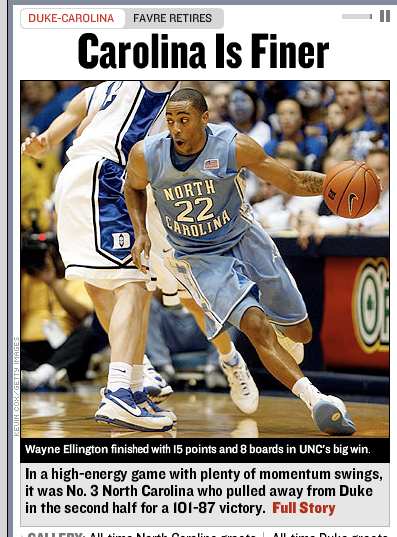 I always feel bad, because I'm a big Tar Heel fan, but I rarely watch the games. Here's why: When I started watching the game, the score started to plummet, and Dook was up at the half. Then I skipped the rest of the game, and we won 101-87. See how much power I have? I know! So, that's me, takin' one for the team. 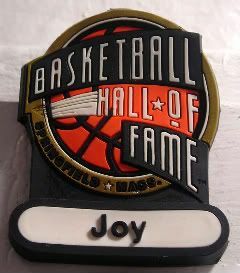 If you have a chance, definitely head up to Springfield, MA, for the Hall of Fame. It's a terrific building, but also, a really great set up. It's kinda like the Guggenheim - you just take the elevator up to the top, and the work your way down the chronological order of the inductees. I love looking at the memorabilia from the players and coaches. Make sure you go with enough time to spend, and with no kiddie distractions. A bit pricey, but worth going if you're at all a basketball fan. Oh! And since you're in the neighborhood, definitely check out the nearby Dr. Seuss National Memorial Sculpture Garden and the museums surrounding it.